Can 18F-fluorodeoxyglucose positron emission tomography predict the response to radioactive iodine therapy in metastatic differentiated thyroid carcinoma? 131I radioactive iodine therapy (RAI) has been commonly applied for metastatic differentiated thyroid cancer (DTC) and played an adjunctive role to total thyroidectomy. However, there is no reliable method to predict therapeutic response to RAI in metastatic DTC. Several studies showed potential use of 18F-fluorodeoxyglucose positron emission tomography (18F-FDG PET) in lesion detection or therapeutic response prediction of DTC. Thus we aimed to evaluate the feasibility of 18F-FDG PET for the prediction of therapeutic response to RAI in patients with metastatic DTC. 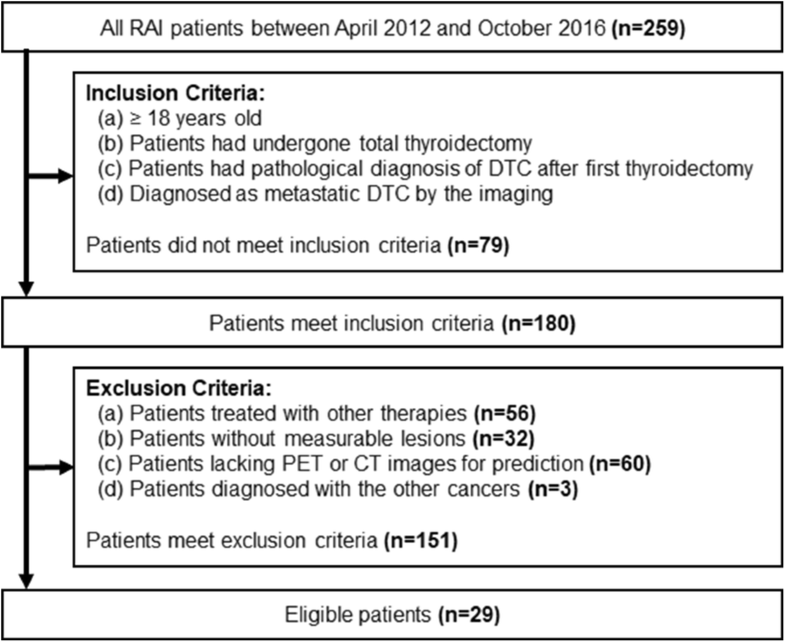 We retrospectively evaluated 29 adult patients with metastatic DTC who underwent RAI after total thyroidectomy. 18F-FDG PET/CT was performed within three months before RAI, and the maximum, average and sum of each maximum standardized uptake value (SUVmax), metabolic tumor volume (MTV) and total lesion glycolysis (TLG) were assessed. Therapeutic response to RAI was categorized into the progressive disease (PD) or non-progressive disease (Non-PD), based on the Response Evaluation Criteria in Solid Tumor (RECIST) 1.1 using pre- and post-therapeutic computed tomography (CT) or magnetic resonance imaging (MRI) images. The area under curve (ROC) analyses were performed to evaluate their predictive potentials of therapeutic response to RAI. Among 29 patients (12 men; median age, 62.4 y.o. ; range, 26–81), eight patients were classified into PD and 21 were into Non-PD. PD patients showed a significantly higher maximum, average and sum SUVmax, MTV and TLG before RAI, compared to the Non-PD group (p < 0.05). Among all the 18F-FDG PET/CT parameters, maximum SUVmax showed the highest sensitivity and positive predictive value (PPV) in predicting treatment response to RAI. With a cutoff value of 9.12, the highest area under curve (AUC) of 0.98 was obtained to differentiate between PD and Non-PD patients. 18F-FDG PET/CT before RAI was a useful predictor of therapeutic response to RAI, and maximum SUVmax was the most sensitive parameter. Differentiated thyroid cancer (DTC), including the papillary and follicular subtypes, accounts for more than 90% of thyroid cancer cases (Siegel et al., 2016; Haugen et al., 2016), and approximately 5–23% of DTC patients develop distant metastases (Lee & Soh, 2010). The 10-year median survival for localized DTC is 80–90%, but for metastatic DTC, it is greatly reduced to 42% (Dadu & Cabanillas, 2012). 131I radioactive iodine therapy (RAI) has been commonly used to treat metastatic DTC and has played an adjunctive role to total thyroidectomy (Cabanillas et al., 2016). The recommended dose of 131I ranges from 3.7 to 7.4 GBq depending upon the distant metastasis or aggressiveness (Schneider & Chen, 2013). In recent guidelines, serum thyroglobulin (Tg) levels and whole-body iodine scans have been employed for the evaluation of treatment response to initial therapy of DTC (Perros et al., 2014). There is no reliable method to predict therapeutic response to RAI in metastatic DTC, and various studies showed a heterogeneous survival rate among the metastatic DTC patients after RAI (Huang et al., 2012; Orita et al., 2010; Ito et al., 2010). Thus, it is urgent to select among metastatic DTC patients who will recur after RAI to optimize the treatment strategy. 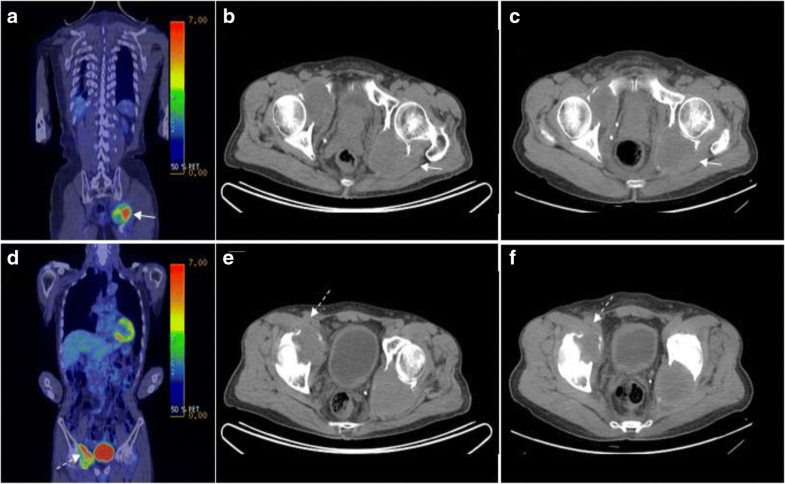 18F-fluorodeoxyglucose positron emission tomography (18F-FDG PET) demonstrated a sensitivity of 73.9 or 88.0% in detection and localization of primary and metastatic/recurrent DTC lesions (Dong et al., 2009; Haslerud et al., 2016; Son et al., 2016), and the 18F-FDG PET may have a complementary role for localizing metastatic lesions even in negative 131I uptake thyroid cancer patients (Dong et al., 2009; Caetano et al., 2016). However, Terroir M, et al. (Terroir et al., 2017) reported that the intensity of 18F-FDG uptake on a per lesion analysis did not correlate with its 1-year tumor growth rate and cannot be used as a surrogate marker of tumor progression. On the other hand, Masson-Deshayes et al. (Masson-Deshayes et al., 2015) recently reported that the number of 18F-FDG-avid lesions and peak SUV corrected for lean body mass (SULpeak) were independent prognostic factors. Some studies suggested that 18F-FDG-avid thyroid cancer would not respond well to RAI and vice-versa (Grabellus et al., 2012; Min et al., 2018). Volumetric parameters such as metabolic tumor volume (MTV) and total lesion glycolysis (TLG) have been evaluated in several cancers, and have been shown to be more precise than the single-pixel quantitative parameter SUVmax. However, to date, volumetric parameters have not been extensively studied in patients with metastatic DTC. Moreover, earlier prediction of treatment response is important in the clinical application and may optimize the treatment strategy, resulting in the improved prognosis of DTC patients. Until now, no clinical examination or imaging modality can promise to predict treatment response in metastatic DTC patients before RAI. Hence, our study aimed to evaluate the feasibility of various quantitative as well as volumetric parameters of 18F-FDG PET/CT for the pre-therapeutic prediction of therapeutic response to RAI in patients with metastatic DTC. We retrospectively reviewed the data of patients with metastatic DTC undergoing RAI from April 2012 to October 2016. From the database of our institution, adult patients (> = 18 years old) after total thyroidectomy due to DTC with metastatic lesions were selected. Patients who were treated with other therapies or did not undergo 18F-FDG PET/CT within 3 months before RAI were excluded. Other inclusion and exclusion criteria were shown in Fig. 1. Metastatic DTC was diagnosed based on findings on computed tomography (CT), magnetic resonance imaging (MRI), whole body scintigraphy just after RAI and bone scan using 99mTc- hydroxymethylene diphosphonate (HMDP). All available images were reviewed by two of the authors (TH & HT), and the final diagnosis of metastatic lesions was comprehensively made by consensus. Longest diameters of the metastatic lesions were measured on CT or MRI before RAI. Measurable lymph node metastasis was defined as the longest diameter of a lymph node being larger than 1.5 cm on the axial plane on CT or MRI. A measurable lesion in other regions was defined as a mass on CT or MRI with the longest diameter of at least 1 cm. Patients without measurable metastasis were excluded from further analysis. A total of 29 patients with 46 metastatic lesions were included in our study. All patients underwent total thyroidectomy before receiving 1.11–5.55 MBq activity dose of RAI. Seventeen patients were evaluated after their first RAI, while the remaining 12 patients were evaluated after the second to tenth treatments. Serum Tg levels were measured within 1 week before and after performing 18F-FDG PET/CT imaging. Serum Tg levels were assessed by a radioimmunoassay in which serum Tg could be detected if more than 5.0 ng/ml. Therapeutic response to RAI was evaluated based on the size change of the metastatic lesions 9 to 12 months after treatments according to RECIST 1.1 (Eisenhauer et al., 2009), which call for one-dimensional, longest-diameter measurements in the axial plane. Briefly, a maximum of five lesions can be evaluated in each patient, with no more than two lesions per organ system. Patients were defined as complete response (CR), partial response (PR), stable disease (SD) and progressive disease (PD). Patient with CR, PR or SD were reclassified as Non-PD, as having a good response (Table 1). The whole body 18F-FDG PET/CT scans were performed following injection of 5 MBq/kg of 18F-FDG after the patient has fasted for more than 6 hours. After 60 min of injection of 18F-FDG, data acquisition was done in three-dimensional mode with 18F-FDG PET/CT scanner Discovery STE (GE Healthcare, Waukesha, WI, USA) or Biograph 16 (Siemens Medical Solutions, Knoxville, TN, USA) scanner. Attenuation correction was performed using a low voltage CT.
Functional SUV images were produced by integrating the data on attenuation-corrected transaxial images, injected dose of 18F-FDG, patient’s body weight and cross-calibration between the 18F-FDG PET/CT and dose calibrator. Semi-quantitative analysis was done using SUV. SUV was defined as follows: SUV = radioactive concentration in region of interest (ROI) (GBq/g)/injected dose (GBq)/patient body weight (g). ROIs were drawn by two nuclear medicine physicians (TH & AB) with the help of CT images of the relevant areas. All parameters from 18F-FDG PET/CT images are the means of the values acquired by the two physicians. There is no significant difference of SUVmax measured between the 2 physicians. 18F-FDG uptake of all metastatic lesions selected for RECIST analyses were quantified with SUVmax and MTV. MTV was measured using a threshold of SUV = 2.5. The SUV threshold was fed into an automated segmentation software, PET-VCAR (GE Healthcare, Milwaukee, WI), to determine the MTV and TLG. The software performs auto-segmentation on the defined threshold and automatically calculates the MTV. TLG was calculated as MTV × SUVmean. Since some patients had multiple metastatic lesions, the maximum, average, and sum of SUVmax, MTV, and TLG of all measurable lesions were calculated. SPSS 22.0 software (IBM, NY) was used for data analysis. All the data were expressed as mean ± standard deviation (SD). Quantitative data were analyzed by independent-samples Student t test. Non-parametric data were analyzed by Mann-Whitney U test. Qualitative data were analyzed by chi-square test. Receiver operating curve (ROC) was used to calculate the optimal cutoff values with their respective sensitivity, specificity, accuracy, positive predictive value (PPV), negative predictive value (NPV) and area under curve (AUC). Significance level value was set at p < 0.05. Characteristics of the 29 patients included in the study are summarized in Table 2. The histopathological subtypes were papillary in 21 patients and follicular in eight patients. A total of 46 measurable metastatic lesions were identified in the lung (n = 18), lymph nodes (16), bone (6), liver (2) and peritoneum (2). Eighteen patients had only one measurable metastatic lesion, while six had two lesions, four had three lesions, and one had four lesions. All patients received RAI with a dose of 1.11–5.55 GBq. Four metastatic DTC patients received initial RAI at a low dose of 1.11 GBq. In three cases, cervical lymph node or distant metastasis were diagnosed by post-therapeutic whole-body scintigraphy. In another patient, the decision was based on clinical condition (The risk of spinal cord compression by swollen thoracic spine bone metastasis induced by high activity was relatively high). According to RECIST 1.1, eight patients were defined as PD, and 21 as Non-PD. Although the serum Tg level before RAI had no significant difference between the PD and non-PD patients, the patients with a greater change in Tg levels responded more poorly to RAI (p = 0.042). Otherwise, there were no statistical differences between the PD and Non-PD patients in the patients’ characteristics (Table 2). The serum glucose level before RAI showed no significant difference between PD and Non-PD patients. All of the maximum, average, and sum of each SUVmax, MTV, and TLG before RAI were significantly higher in the Non-PD patients, compared to those of the PD patients (p < 0.001, respectively; Fig. 2). The maximum SUVmax showed the highest AUC (0.98), and when the cutoff value of 9.12 was set, the sensitivity was 100%, and specificity was 87.5% (Fig. 3, Table 3). One exceptional case is shown in Fig. 4. A 72-year-old male patient with bone metastases showed a decreased longest diameter of tumors 10 months after RAI and was defined as Non-PD. However, all 18F-FDG PET/CT parameters but the maximum SUVmax showed extremely high levels before RAI. Only the maximum SUVmax showed a value of 8.1, which was lower than the cutoff value of 9.12. In the current study, we evaluated various quantitative as well as volumetric parameters of 18F-FDG PET/CT for prediction of response to RAI. Cut-off values with the statistically significant ability of response prediction were found for most of the 18F-FDG PET/CT parameters. However, the maximum SUVmax showed the highest AUC (0.98) with the highest sensitivity of 100% and specificity of 87.5% for predicting RAI response in metastatic DTC patients. Prediction of treatment response is important in cancer therapies. In the patients with poor response to RAI, especially the RAI-refractory DTC patients, treatment strategies should be switched to other systematic therapies such as kinase inhibitor therapy or other conventional chemotherapy (Haugen et al., 2016; Ito et al., 2014). During recent years, 18F-FDG PET/CT parameters have been well studied in DTC (Marcus et al., 2015). Patients with positive 18F-FDG PET/CT may be considered candidates for surgical intervention or external radiation therapy since FDG-avid lesions have been reported to seldom improve with RAI alone (Bannas et al., 2012). Even high-dose RAI had little or no effect on the viability of metastatic FDG-avid thyroid cancer lesions (Wang et al., 2001). Masson-Deshayes, et al. 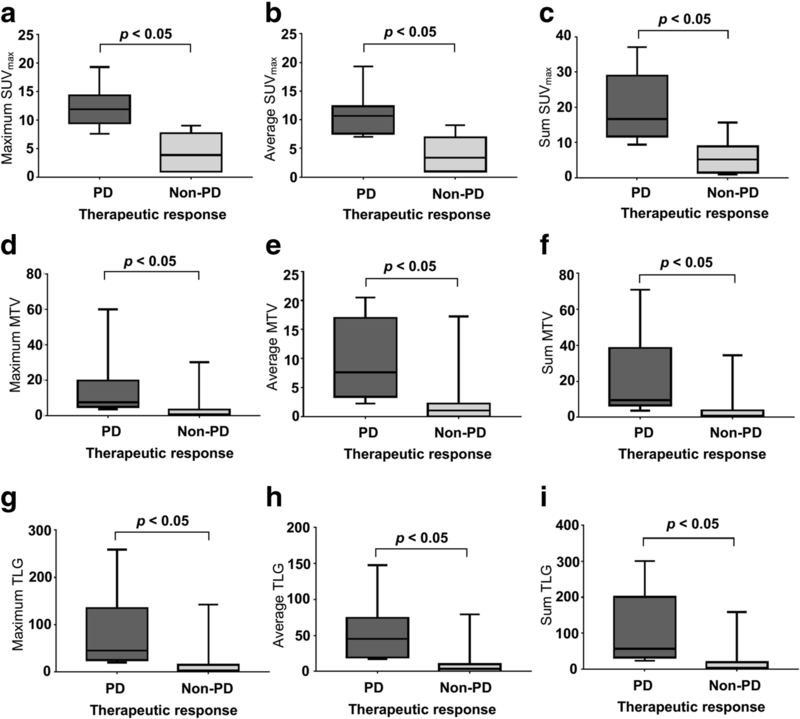 (Masson-Deshayes et al., 2015) reported that metabolic parameters of 18F-FDG PET/CT were prognostic factors in metastatic DTC, but they did not evaluate the short-term response to RAI. In our study, we focused on the evaluation of treatment response after one cycle of RAI. Compared to the long-term evaluation of survival, short-term evaluation is less likely to be influenced by other factors, such as the difference of treatment strategy, so our results may practically contribute to setting a treatment strategy for metastatic DTC patients (Hou et al., 2017). To our knowledge, this is the first study to evaluate the quantitative as well as the volumetric parameters in metastatic DTC for response evaluation. Maximum SUVmax showed higher sensitivity, positive predictive value (PPV), and accuracy, compared to MTV and TLG. In our study, one patient with large tumor size showed extremely high values of MTV and TLG, but the maximum SUVmax classified this patient into Non-PD. These results suggested that the intensity of FDG uptake may be more important than the volume of the metastatic tumors for the prediction of treatment response in DTC patients with distant metastases (Lee et al., 2014). Metastatic DTC is a rapidly progressive disease with an average interval between the first and second metastases of less than 15 months (Wang et al., 2014), as confirmed by our findings. Therefore, RECIST 1.1 may be applied in this clinical setting. One previous study by per lesion analysis showed that both SUVmax/lesion and MTV/lesion were not correlated with 1-year tumor growth rate in metastatic DTC patients (Terroir et al., 2017). In comparison, our study showed all 18F-FDG PET/CT parameters were significantly higher in the PD patients than those in the Non-PD patients. The evaluation of the treatment response was based on RECIST 1.1 in our study, while the previous study evaluated the lesions by calculating tumor growth rate (Terroir et al., 2017). When evaluated by RECIST 1.1, the growth of tumors is not analyzed separately but is calculated as the sum of longest diameters of all target lesions in each patient. Moreover, recurrence and metastasis of the tumor lesions is also considered during the evaluation. Therefore, we suspect that per patient based analysis using RECIST may be more accurate and practical in clinical application. In the recent guidelines, low serum Tg level of DTC patients after total or near-total thyroidectomy and RAI has been emphasized to indicate an excellent response (Haugen et al., 2016; Cabanillas et al., 2016; Perros et al., 2014). A previous study showed that the serum Tg level correlated with the long-term clinical outcome of 444 patients with metastatic DTC after RAI (Durante et al., 2006). In our study, the Tg level before treatment showed no significant difference between PD and Non-PD patients. However, the change in Tg levels showed a significant difference between the two groups, which may indicate that dynamic Tg assessment may also predict treatment response. Miyauchi et al. recently proposed a new tool, Tg doubling time (Tg-DT), to predict the survival and development of disorders in DTC (Miyauchi et al., 2011). This parameter, reflecting the dynamic change of Tg, was proved as an independent predictor of disease-specific mortality, loco-regional recurrence, and development of newly identified distant metastases in DTC. There were several limitations to our study. Firstly, various factors can impact the therapeutic response to RAI, such as age, dose of RAI uptake ratio of radioactive iodine, tumor size, metastatic organs, and so on. These factors were not controlled consistently, due to the retrospective nature of this study. Moreover, the serum glucose level can impact the value of FDG-PET parameters. Secondly, the number of patients included was small. Only 29 (11.2%) patients among 259 patients were enrolled in the recent study. The unequal patient number (21 PD versus 8 Non-PD) also led to the intrinsic statistical limits of this study. A larger number for analysis is necessary to confirm our results. Thirdly, since many cases were excluded due to lack of imaging examinations such as 18F-FDG PET/CT before treatment, further studies are encouraged with a larger number of patients. Fourthly, our recent study focused on the metastatic DTC patients. The growth of thyroid cancer is slow, so it is difficult to differentiate between PD and Non-PD patients without metastases. 18F-FDG PET/CT before RAI for metastatic DTC patients may be a useful tool to predict short-term treatment response. The higher value of maximum SUVmax before RAI may predict PD. The authors thank Dr. Takahito Nakajima and Dr. Hirofumi Hanaoka for their support. The authors thank Dr. Oyunbold Lamid-Ochir, Dr. Adhipatria Kartamihardja, and Dr. Putri Andriana for the support of data collection. The author also expressed deep respect and gratitude to the JSPS KAKENHI (Grant Number JP15K09945) and the Otsuka-Toshimi Scholarship Foundation for supporting this research. Finally, the authors thank the staff of the Department of Diagnostic Radiology and Nuclear Medicine from Gunma University Graduate School of Medicine for data analysis and reviewing of the manuscript. This work was supported by JSPS KAKENHI Grant Number JP15K09945. The first author had financial support for his stay in Japan from the Otsuka-Toshimi Scholarship Foundation. XZ participated in the design of study, the collection of data, statistical analysis, and preparation of the original draft manuscript. TH participated in the design of study, the collection of data, statistical analysis, and preparation of the original draft manuscript. AA participated in the design of study, the collection of data, statistical analysis, and preparation of the original draft manuscript. AB participated in the statistical analysis, and preparation of the original draft manuscript. HT participated in the design of study, the collection of data, and preparation of the original draft manuscript. HNT participated in the preparation of the original draft manuscript. AY participated in the design of study, and preparation of the original draft manuscript. HH participated in the preparation of the documents for ethic committee approval, statistical analysis and preparation of the original draft manuscript. ATT participated in the preparation of the original draft manuscript, and grammatical correction of the manuscript. YT participated in the statistical analysis, preparation of the draft manuscript, and final review of the manuscript. All authors read and approved the final manuscript. The recent research was approved by the ethic committee from Gunma University Hospital.